The location was in my living room in Bethesda, Maryland. The "Take It!" came from a slow image impression that arrived in my mind when waiting for a Sunday morning favorite TV show to come on. I kept looking up from the newspaper which I was reading and noticing there was something quite different about what I was looking at and had seen many many times before. 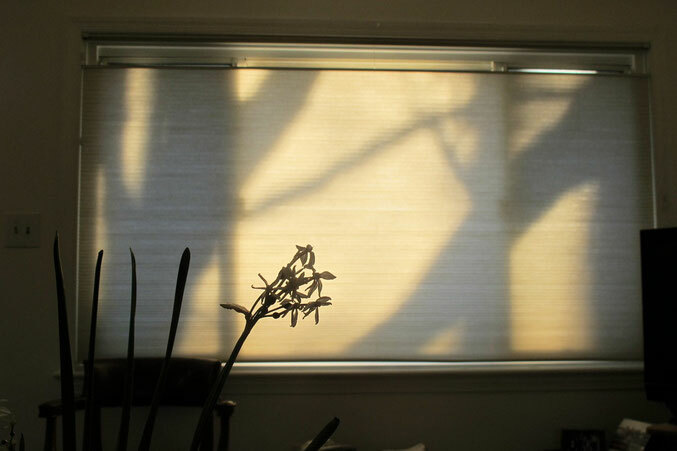 It was the usual shadows cast from the trees in the front yard onto the shade on the front window in the living room. This time it was different as there was a visiting narcissus plant which was in bloom with all its fragrance that was placed on the coffee table in front of me that had somehow been positioned to be framed in those cast shadows in seemingly just the right way. I think it could be cropped and manupulated to take on the look of some form of Oriental approach to art. The After Take: This one is ever so easy and peaceful to look at. I keep finding myself coming back to look at it again and wind up with the addition of some linger. Hope your day includes peace and enjoyment. Thanks for joining us for the current photo presentation. You are cordially invited to return on Friday April 13 for a new picture that we hope you will enjoy. Hope you have a good day too Bruce. Thanks for sharing! The tree outside my kitchen window often gives me shows like these. I had no idea there was a plant called the narcissus plant. When I first read it I sat there thinking you misspelled narcissist. I then sat there wondering how a plant could be narcissistic. Is the lil plant in the foreground a silhouette or its shadow? Either way, very cool lookin'! ?